Whose Name is also nam'd Rachel Chiesley or Mrs. Erskine. and a Cause for Remorse. You can read the Cherub of Desire's book by clicking just here. Available in printed and Kindle formats. In the year 1739, the Cherub of Desire wrecks her glorious ship upon the remote island of St Kilda. She wades ashore in an understandable fury, leaving her grumbling slaves to mend the Vessel. Her mood is not improved when she stumbles across a wild-haired woman who insists on engaging in endless conversation. 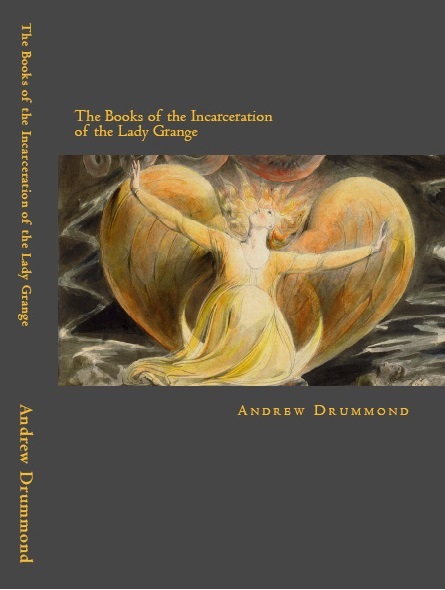 This is the Lady Grange, the unfortunate but loving wife of one of Scotland's political elite, kidnapped from Edinburgh by her husband's allies and deposited neatly out of sight upon the island. While her ship is being repaired, the Cherub passes the time in seducing young men and married women, and in trying to avoid the unhappy prisoner. At length, in a fit of unaccustomed charity, she agrees to carry to Edinburgh some letters in which Lady Grange begs her friends to rescue her. The Cherub considers this to be a good excuse for a well-deserved holiday in the bright lights of the big city. But due to encounters with disaffected Highlanders, debauched clan-chiefs, deluded poets and despotic lawyers, her holiday does not go well. No, not at all well. Who am I I am the Cherub of Desire. Aye well that may be hard to credit I hear you whisper amongst yourselves who does she think she is with all that blasphemous blether all that sinful profession as if we did not ken what she really is she is a common hoor that she is she is that. Aye that may well be hard to credit says you but know this that though I sit now far from my Dominion out there in the airy breezy shores of the western isles I have the body of Delilah the wisdom of Miriam the strength of Judith she who gave Holofernes a night to relish all that makes me the Cherub of Desire that makes you mere nothings mere bothersome midges and flickering moths in the candle of the years. What right have you to mutter to mouth to mumble your curses against me I who could in a moment strike you down take your men from you turn them inside out hand them back never fit for another days work or another mornings pleasure. What miserable tittle-tattle you pass back and forth. Let me tell you a thing or two aye settle down before me do not weep in terror but pin back your lugs for I have some stories to tell you that will make you think twice nay thrice yea maybe even four times if I can get away with it. Who am I I am the keeper of the brothel-house well-kent in Edinburgh it is nam'd The Caledonian Literary Discourse Club. The fine discursive gentlemen of the town form an orderly line from the striking of nine hours onwards outside my chambers inside I keep an orderly house. You women of Edinburgh ken it well to be true your men are safe enough with me discussing Art Oekonomics Poesy Politics the like they come home the happier they leave you in peace yet you never cease your complaints against me you wail that I have done you wrong. Who are you you are the ladies who have never set dainty foot inside The Caledonian Literary Discourse Club who have ask'd me this have ask'd me that crying what for for why why now with never a break until I want to smack you about the heid for to stop your gabbing. But none has yet ask'd me for why do my seven meretricians labour so wild so hard so earnestly. It is the consider'd judgement of the ladies of Edinburgh that I have this house of carnal pleasures surely only for the benefit of the helpless men of that city that is of course so far from the truth of things that I should laugh until my hat falls to the floor. The siller the gold and the notes so promissory that tumble into my hands are design'd for one thing one thing alone that is the acquisition of excellent material for the construction of a Vessel such is my sole ambition the only ground and reason nay the only excuse for the forward frolicking of my several servant angels. My Vessel will be not like any Vessel seen before it will plough swifter through the foamy waves slice sharper through the Greeny Deeps run mightier o'er the Mossy Moors than the bloody flux itself. Even so shall it be that my Vessel will fly through the Misty Airs when so requir'd to do like yon whats it call'd yon avenging creature of the LORD that smites down from the pearly sky upon the sinners the wastrels the lairds of Scotland with fires pouring from its jaws brim-stone from its eyes boiling waxes from its lugs aye such will be The Lienteria as its name is nam'd. In 1735, Sir Alexander Murray of Stanhope proposed that the island of St Kilda be devoped economically, socially and militarily, as a bastion of Scottish power. On it, he proposed to settle some 5000 people. Obviously, he had never been there. I have transcribed his plausible proposal from a manuscript held in the National Library of Scotland in Edinburgh. Some of the ms. is illegible, and some missing. Possibly a good thing.